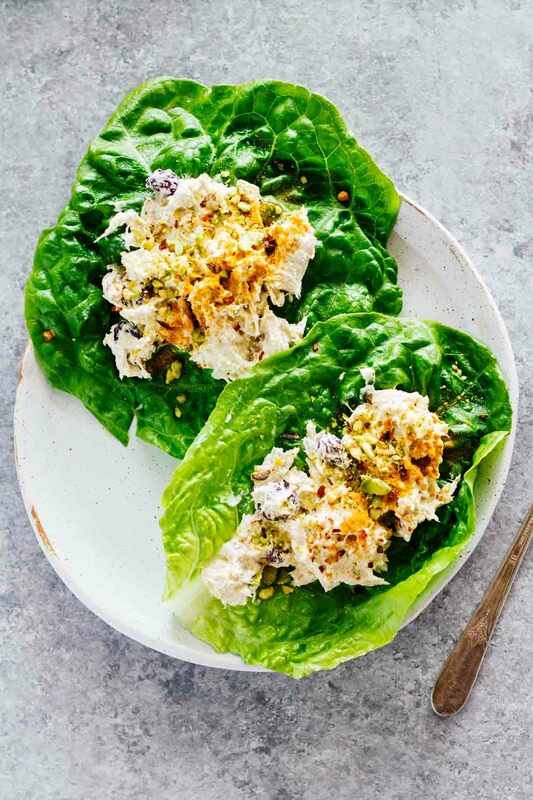 Creamy, savory, deliciously lightened-up Turmeric Greek Yogurt Chicken Salad Lettuce Wraps! These heavenly wraps are a wonderful healthy lunch option that can be taken on-the-go and made in 5 minutes or less. You guys. Things are getting all kinds of crazy over here with my turmeric obsession! 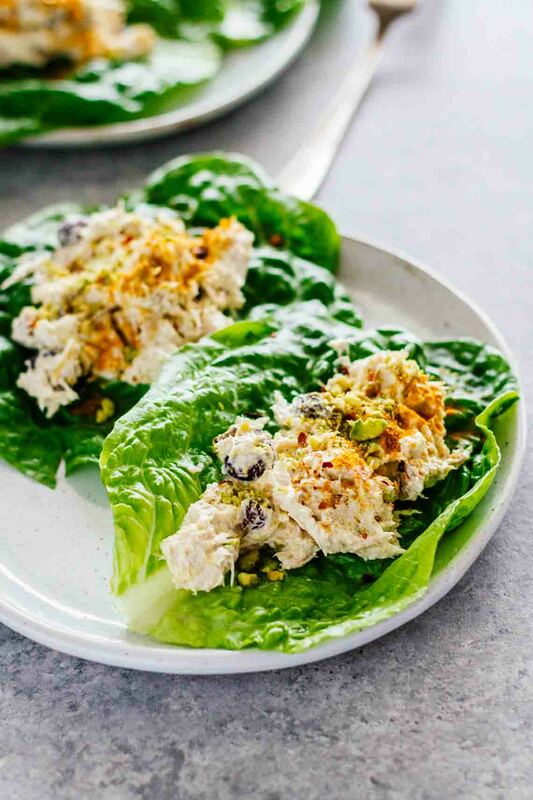 I was never really a chicken salad kinda girl until I moved to northeast Texas, where I found a restaurant (well, one of the only restaurants in our town) that happened to have the BEST chicken salad on a soft croissant. Like, the best I’ve ever ever ever had! Maybe because it was pretty much the only chicken salad I had ever really had, but still! It was just incredible, and I obviously still have not stopped thinking about it to this day. Buuuuuuut there was this one problem that I had with it, same problem I have with most foods that I adore….NOT healthy. Contrary to popular belief, just because it has the word “salad” in it doesn’t make it healthy. Huge bummer, I know. SO I set out to make my own version that I knew I could feel good about! And then it transformed into this heavenly, delicious accident. 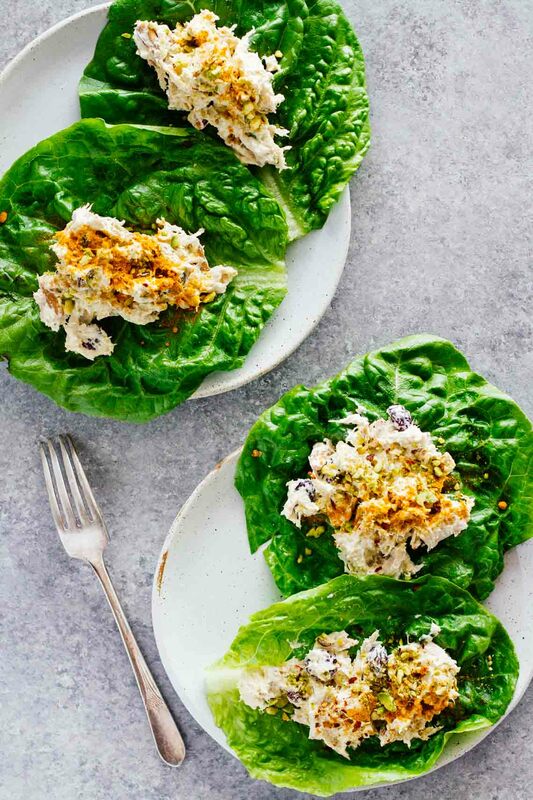 These Turmeric Greek Yogurt Chicken Salad Lettuce Wraps can be made in just 5 minutes! I know it sounds crazy! But my life saving technique (not just for this recipe, but in every day life) is to buy an entire small, organic chicken and roast it (using this roaster) in the oven at 425 degrees for about 2 hours. It’s the easiest thing EVER, and then I have leftover chicken to use throughout the week! Since I did that last night, I used the leftover chicken to make this Turmeric Greek Yogurt Chicken Salad in just a few minutes. So great, y’all! I also love making these Healthy Sriracha Shredded Chicken Tacos and this Chicken Fajita Casserole recipe with leftover roasted chicken! As far as the turmeric factor in this recipe, it’s totally optional! I added a little bit of ground turmeric and crushed red pepper for added flavor because the two together are EPIC, but feel free to play around with adding in different spices. 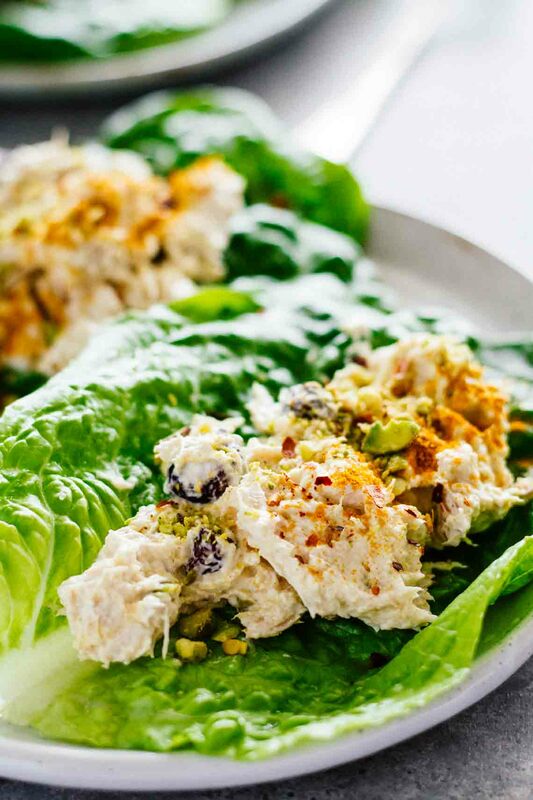 Top each lettuce leaf with the chicken salad and enjoy!